Jan Kuciak's desk was kept just as it was the day he left work for the last time. On it lay a book about Italy's 'Ndrangheta mafia. The young investigative reporter had been working on a sensational story for his news website, Aktuality.SK. It was a scoop that would bring down the government of his native Slovakia. But it cost him his life. He and his fiancée Martina Kusnirova were found shot dead at close range at their home in the village of Vel'ka Maca outside the capital, Bratislava. They were only 27. Kuciak had uncovered a story that takes in the mafia heartlands of southern Italy and led to the City of London. It involves mobsters, hit men, politicians and money launderers and reveals that the mafia has spread far beyond Italy. 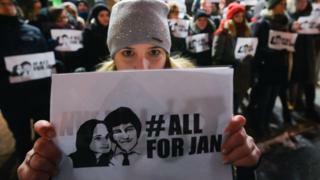 Slovakia's reaction to the double murder was immediate. There were huge street protests in Bratislava that eventually led in March to the fall of the government, then headed by Prime Minister Roberto Fico. Jan Kuciak's investigation was only published after his death. He had exposed the presence of the 'Ndrangheta in Slovakia. But he also discovered apparent business links between an alleged 'Ndrangheta member called Antonino Vadala and two senior government advisers. Both advisers worked for Prime Minister Fico, although no evidence has emerged that he knew of the links. They too stepped down temporarily while the matter is being investigated but vehemently denied any connection with "this horrid crime". Antonino Vadala claimed he was simply an entrepreneur, but he was subsequently extradited to Italy where he faces charges for cocaine smuggling. He faced separate charges in Slovakia for attempting to fraudulently obtain European Union subsidies. He denies all charges. Meanwhile the hunt for the killer of Jan Kuciak and Martina Kusnirova goes on. Kuciak discovered that Antonino Vadala was a member of the notorious Vadala clan based in the small town of Bova Marina in Calabria in the south of Italy. The family is one of 150 clans that constitute the highly secretive 'Ndrangheta. Bova Marina is a small coastal town where old people shelter from the midday sun in fly-blown bars or under the palm trees and bougainvillea of the small local park. The town's large pink town hall has been closed for years. The government has suspended the local council, the Comune di Bova, due to mafia infiltration. For around 140 years, the 'Ndrangheta has been the real power in Bova. Here, two clans hold sway together - the Vadalas and the Libris. The 'Ndrangheta began as bandits after the unification of Italy in 1871 and is now considered the most powerful organised crime syndicate in the world with an estimated 10,000 members. It controls more than 80% of the cocaine smuggled into Europe from Central America and makes up to €90bn (£80bn; $104bn) a year. It smuggles people and organs too, and earns billions from embezzling funds from the European Union and local government. The BBC has learned that the 'Ndrangheta is laundering billions of euros in illicit profits through the City of London with the help of corrupt "enablers", including lawyers and accountants. Law enforcement agencies in the UK and Italy have joined forces to investigate what legendary anti-mafia prosecutor Nicola Gratteri describes as a global entity. "The 'Ndrangheta's based on family and blood ties that makes it hard to penetrate," says Judge Gratteri, who has convicted more than 6,000 mafiosi over a 35-year career. In Condofuri, which borders Bova Marina, a sign above the town hall reads: "The 'Ndrangheta does not enter here." Infiltration meant that its town hall also had to close and the former mayor and council were suspended after mafia attempts to win public works contracts. The new mayor, Salvatore Mafrici, is a leading anti-mafia activist who complains that organised crime has stunted the town's growth. "Our best people are forced to leave this enormously beautiful place. This stems from our main problem - the heavy weight on our shoulders that is the 'Ndrangheta." Italy's main anti-mafia police, the Guardia di Finanza, estimates that the group now operates in 50 countries around the world, and it is working with the UK's National Crime Agency on its money-laundering activities in the City of London. "We have more than reasonable grounds to think... London is one of the places they buy properties to invest the money," says Col Emilio Fiora of the Guardia. The UK's National Crime Agency would not comment on any current investigation but told the BBC that organised crime syndicates laundered hundreds of billions of pounds a year through London, mainly through complicated company structures. The agency's head of partnerships and threat reduction, Emma Smith, said corrupt professionals were helping organised crime groups to launder money. "The City of London is a major financial centre so it is only natural that the volume of transactions going in and out of London on any given day is enormous. There is a proportion of that which is illicit finance," she said. Judge Nicola Gratteri called on law enforcement agencies across the world to take the growing threat from the 'Ndrangheta seriously. "If these billions of euros that the 'Ndrangheta makes from selling cocaine become part of the formal economy, they could blow up the economy and destroy democracy," he warned.